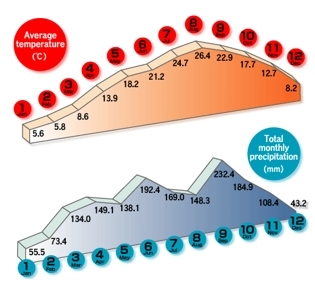 The temperature in Sapporo during the period of the conference ranges between 13 – 22℃ . Japan Standard Time is GMT+9. The time difference for major cities is shown below. Electric current is uniformly 100 volts AC throughout Japan but with two different cycles: 50 in eastern Japan including Tokyo and Yokohama,and 60 in western Japan including Kyoto, Osaka and Nara. Leading hotels in major cities have two outlets of 100 and 230 volts. However, the sockets usually only accept two-leg plugs. To visit Japan, you must have a valid passport. A visa is required for citizens of countries that do not have visa exemption agreements with Japan. Please contact the nearest Japanese embassy or consulate for visa requirements. Currency in Japan is the yen (JPY). Notes are available in denominations of 10,000, 5,000, 2,000 and 1,000 yen. 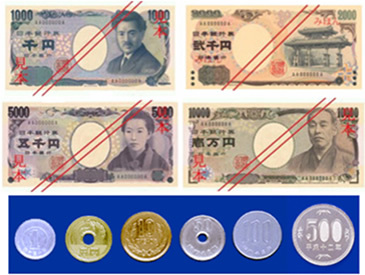 Coins are minted in denominations of 500, 100, 50, 10, and 1 yen. Exchange at the airport is recommended for your convenience. Most foreign currencies and travelers' checks can be exchanged at authorized foreign exchange banks and hotels. However, we highly recommend purchasing travelers' checks or cash in yen before leaving your home country. A passport may be required for currency exchange services. American Express, Diners Club, Visa and MasterCard are widely accepted at hotels, department stores, shops and restaurants. Banks are open from Monday to Friday from 09:00 - 15:00, and you can exchange money at foreign exchange banks, but there are not many of them. Instead, you can withdraw JPY cash from ATM machines in convenience stores such as Seven-Eleven. There is no custom of tipping in Japan. Instead, at high class restaurants, bars and hotels, a 10% service charge is usually added to the bill. Shops and malls in Japan are generally open on Saturdays, Sundays and national holidays as well as weekdays from 10:00 to 20:00. Department stores, however, are closed on one weekday differing by store, and certain specialty shops may not open on Sundays and national holidays. For general transport, taxis are convenient, but they can be costly. Public transportation such as JR and the Sapporo Municipal Subway are also convenient, but much more cost efficient. Sapporo is the capital city of Hokkaido, which is an island located in the northern regions of Japan. The city has a populations of approximately 2 million to date. It has much to offer visitors: from the tasty delights of fresh seafood; to the beautiful green, tree-lined streets; to the untouched, vast nature that surrounds it. Sapporo’s modern facilities combined with wonderful scenery and nature make it a great choice to host an international conference. It is the perfect starting point to explore the island of Hokkaido. 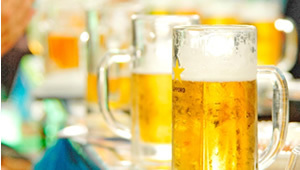 Drop by the Sapporo Beer Garden to try Sapporo’ s most famous beer. One can try beer tasting at a reasonable price, and the food is outstanding as well. There is also a museum on Japan’s beer history. 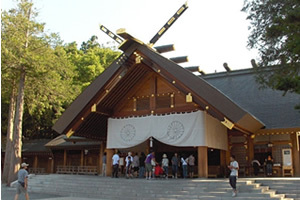 The Hokkaido Shrine is a Shinto shrine located in central Sapporo. It was constructed in 1869 and enshrines four different deities. It is surrounded by nature. 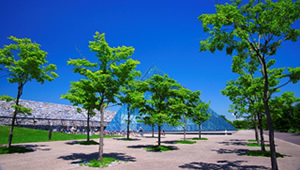 Moerenuma Park is a large park with a massive pyramid building known as the Hidamari. The park was designed by Isamu Noguchi. 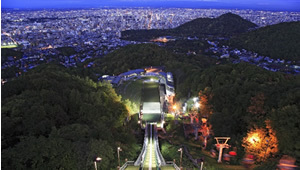 One of the best places in Sapporo to catch breathtaking views of the city. The 1972 Sapporo Winter Olympics were held here. Take a ride up on the chairlift to see Sapporo from the top. 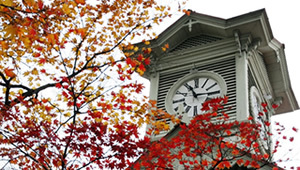 The clock tower is perhaps the most famous icon of Sapporo. Inside is a museum with information about Sapporo’s and the clock tower’s history. It was built in 1878 and is of American design. 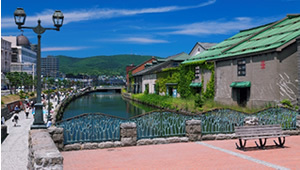 Otaru is a port city reachable from Sapporo by train or by car in approximately 30 minutes. It is known for its picturesque buildings and delicious sushi. Otaru is also home to the Nikka Whiskey Distillery. 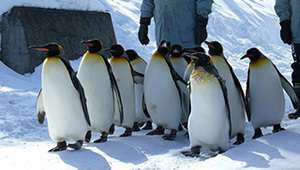 The Asahiyama Zoo is a very famous zoo and is in Asahikawa City, the coldest city in Japan. Its polar bear and penguin exhibitions are particularly spectacular. Eventhough the zoo is located about 2 hours from Sapporo; many tourists still make a side-trip to visit, when they come to into the city.